Rage is a game made by id, published by Bethesda, and if rumors are to be believed, protected from pirates by Valve. DRM is such a divisive issues that no matter what you do, someone is going to be unhappy with you. As DRM goes though, Valve's Steamworks is one of the best around, and it's rumored that id Software's Rage will be joining the Steamworks stable when it's released next year. The rumors center around the appearance of a page for the game on the Steam store. 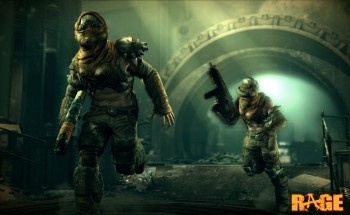 The page is hardly conclusive evidence by itself, but when combined with the fact that Fallout: New Vegas and Brink - two other Bethesda published games - will also use the system, along with lead designer Matt Hooper's comments that gamers would be pleased by Rage's DRM solution, it certainly suggests that the system is at least a likely contender. Hooper said that the announcement about the DRM would come when id talked about the game's multiplayer, but didn't reveal exactly when that would be. As part of Steamworks is access to the Steam infrastructure - which would include friends lists and voice chat - combining the two into a single announcement could be considered another sign that Rage will use the system, but until Bethesda decided to unveil it, we won't know for sure. Rage is scheduled for release for PC, PS3 and Xbox 360 on September 13th, 2011.